Kammok Glider Rainfly. 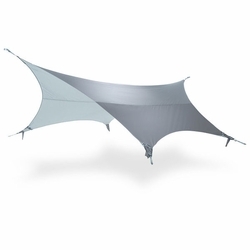 The Glider™ is the first portable hammock shelter to feature a fully integrated rainwater retention system. The design of the Glider is inspired by the sugar glider – a small mammal that glides between trees and protects its young from the elements in its marsupial pouch. The Glider integrates seamlessly with your Roo and Dragonfly to create the ultimate light-weight camping experience. The proprietary Amphibiskin™ fabric keeps the adventurer protected from blistering heat, rain or snow. The Glider’s water retention system opens up new opportunities for water collection in the backcountry.